What is this IPv6 Transition? - The story of AB Publish - From Start to end! Currently the Internet operates on the fourth version of the Internet Protocol (IP) and is the first version to be widely accessible and used by the public. It is known as IPv4. An IP address identifies a specific and unique piece of hardware on a network. In simple terms IP addresses can be thought of as telephone numbers. The current protocol is not extensive enough for the current demand of Internet addresses. Basically we have run out of telephone numbers! No new telephone numbers...no new computers can be added to the Internet! Why do we need an Internet Protocol anyway? The Internet operates by transferring data in small packets across networks following rules defined within the Internet Protocol. Each packet contains two numeric addresses - the IP address of the packet's origin and the IP address of the packet's destination. These origin and destination IP addresses ensure the data is transferred to the correct location, via various networks. The Internet Protocol is a set of rules that looks after the transfer of these packets of data. Part of the protocol is how to define each IP address, and this is currently determined via 4 sets of numbers between 0 and 255. Each number is separated by a dot. For example, 192.168.1.1 or 196.128.64.64. When the IPv4 scheme was introduced in 1977, the potential 4.3 billion different IP addresses seemed to be sufficient. Due to exponential growth and demand, this is no longer the case. IPv6 is a new 128-bit numbering method which will handle up to 340 trillion trillion trillion addresses. This will solve the depletion of IP addresses for the foreseeable future. The new addresses will be held in the form of 8 sets of numbers, each with 4 hexadecimal digits, but still separated by a dot. For example, 2011.adab.a6ff.1969.19ed.e1b2.ffff.0007. In addition, there are many enhancements buried deep within the new protocol. Advanced security, communication, layering and new protocols are just some of the improvements. Mostly this will be invisible to us but it is a definite progression for the Internet. In order to ensure a smooth transition, there will be an overlap period where IPv4 and IPv6 will coexist as protocols on the Internet. What does this IPv6 transition mean to me? The potential problem is with the hardware between your device and your destination. It is the router and your Internet Service Provider's equipment that may cause problems as they may not be able to handle the new IPv6 connections. To ensure maximum connectivity and minimal problems, most major Internet Websites will be running dual-stacks, which will allow visitors to get to the sites using either an IPv4 or an IPv6 connection. There may be problems if your router thinks it can handle IPv6 but in reality it cannot. It will try the new and more advanced IPv6 firstly, may not complete successfully so gives up after a while and eventually trys again using the current IPv4 connection. This may result in delays. The International Internet Society had organised a World IPv6 Day. 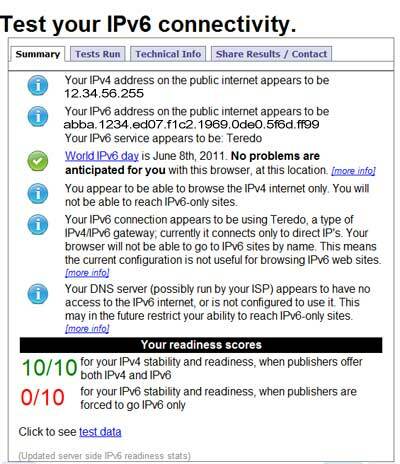 It will occur on June 8 and is aimed for website owners, Internet Service Providers and users to try out IPv6. Some of the biggest website have agreed to take part (Google, Facebook, YouTube...) and to initiate their IPv6 during 24 hours. This will enable us to see which websites (and which Internet Service Providers) will not be able to handle dual-stack connectivity.